The purpose of this position is to have an individual who will teach students in Grades 9-12 in the field of Foreign Language and will serve as a member of an interdisciplinary cluster of teachers serving the same students. 1. Bachelor’s Degree from an accredited college or university. 2. Licensure from the Massachusetts Department of Education for the grade(s) and subject(s) assigned. 3. Demonstrated subject matter competence, highly qualified, in the area of licensure. 1. Currency in the curriculum including knowledge of the Massachusetts Curriculum Frameworks. 2. Effective planning and assessment of curriculum and instruction. 4. Effective instruction in a standards-based classroom. 5. Promotion of high standards and expectations for student proficiency. 6. Promotion of equity and appreciation of diversity. 7. Effective integration of technology across the curriculum. 8. Fulfillment of professional responsibilities. 1. Ability to deliver effective instruction. 2. Ability to differentiate instruction to meet student needs. 3. Ability to administer required student testing and assessments. 4. Ability to communicate clearly and effectively with students, parents, colleagues and administrators. 1. Effective classroom management skills. 2. Excellent listening, speaking, reading and writing skills. 4. Skills in the specific subject matter of instruction. Supervises students and evaluates their achievement. Supervised by principal and/or director. a.	Utilizes effective and varied instructional techniques and procedures. b. Provides a standards-based, student centered environment in each class taught. c.	Utilizes educational materials properly. d.	Maintains a pleasant, neat and well-organized classroom. e.	Performs scheduled duties promptly. f.	Fulfills paperwork responsibilities promptly. g.	Maintains professional competence through in-service educational activities. h.	Demonstrates a thorough knowledge of the content area. i. Understands and implements the Massachusetts Curriculum Frameworks. k.	Assumes responsibility for providing a safe, supportive learning environment for every student. l.	Relates well to students of varied proficiency. m.	Provides and promotes opportunities for students to develop a wholesome self-concept. n.	Guides students toward self-control. o. Provides effective student structure in the total school setting. p.	Accepts responsibility for the well-being of each assigned student. q. Remains approachable to students and parents, as needed. r.	Contributes to a positive and effective working relationship between school and home. a.	Adheres to the academic, ethical and social standards of the profession. b. Speaks and writes clearly, understandably and appropriately. c.	Dresses appropriately and is well-groomed. e.	Applies suggestions for improvement. f.	Uses confidential information for professional purposes only. g.	Is equitable and sensitive and responsive to all learners. h.	Realizes that good attendance is necessary for effective learning. i.	Participates in ongoing professional development, including all district sponsored initiatives. j.	Aligns instruction to the Massachusetts frameworks and to departmental syllabi. a. Shows evidence of helping to promote positive working relationships will school personnel. b. Demonstrates willingness to share and exchange ideas, skills, techniques and materials. c.	Works effectively with administrative personnel. d.	Accepts and implements school and district decisions. e.	Fulfills assigned duties and out-of-class responsibilities. f.	Complies with school department procedures and school committee policies. Salary: As per the WEA contract. Waltham Public Schools has partnered with the Massachusetts Partnership for Diversity in Education (MPDE) in our effort to welcome diverse candidates to our school system. We value and prioritize the hiring of educators who bring a wealth of perspectives and experiences to our schools, and who reflect the diversity of the students we serve. Welcome to Waltham High School! 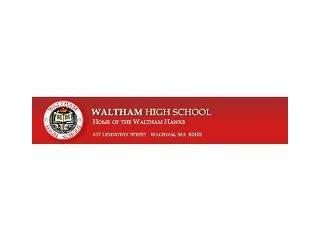 The mission of Waltham High School is to provide a safe, supportive learning environment that fosters academic achievement and the physical and emotional well-being of all students within our diverse urban community. We promote a standards-based curriculum with the goal of proficiency for all students. As a comprehensive high school, we value the exploration of both the fine and practical arts and the examination of a wide range of career and technical education pathways. We strive to develop contributing citizens who are aware of their rights and responsibilities in a democratic society. 1. Communicate clearly and effectively. 2. Read, write, and listen for understanding. 3. Apply analytical, critical, and creative thinking skills. 1. Value community and diversity. 2. Advocate for self and others. 4. Demonstrate an understanding of physical and emotional wellness. Waltham Public Schools is committed to maintaining a work and learning environment free from discrimination on the basis of race, color, religion, national origin, pregnancy, gender identity, sexual orientation, marital/civil union status, ancestry, place of birth, age, citizenship status, veteran status, political affiliation, genetic information or disability, as defined and required by state and federal laws. Additionally, we prohibit retaliation against individuals who oppose such discrimination and harassment or who participate in an equal opportunity investigation.